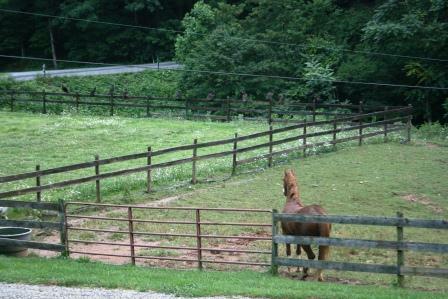 The other day I noticed that Zip was acting funny in the pasture. He kept looking at something. And snorting. And prancing about. Can you notice anything strange? It took me a minute before I saw what had him all in a huff. Ten vultures on the fence. No wonder he was worked up. As I walked down to snap pictures, they began to fly away. Zip then did a celebratory gallop about the pasture. Birds beware. This horse doesn't want you on his fenceline! It's Rural Thursday and everyone is welcome to join in with Nancy from A Rural Journal and myself. Just write a post about something rural (recipes, sewing, crafts, wilderness hikes - these all fit in perfectly) and add the button to your post by grabbing the code below and pasting it into your blog. Then come back and link up your website. Please remember to visit the blogs (and leave a comment) of 5 other participants. Can't wait to read what you write! Must have been something good to eat to gather that many birds.I enjoy seeing them, fun to see them in group like this. Have I ever told you that I Love horses???? Great pics, Lisa, and I don't blame Zip for fussing about the vultures!!! I don't blame him. That is a lot of vultures! How funny that he was so observant and it got your attention. Go away you vultures! I really don't like it when they hang around either to be honest. 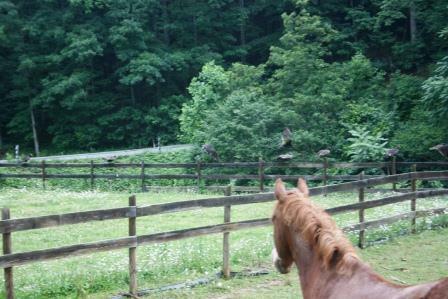 "That's my fence, Birdie... YOU stay OFF of it." Then vultures is definately something to snort about! It took me a while to see them in that picture. How funny. How dare those vultures harass beautiful, Zip! Glad you chased them off. hmmmm, i wonder what those vultures were up to. something must have drawn them in!! poor zip....i'd be huffin' & puffin' too!! 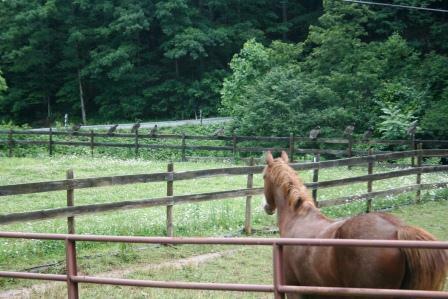 my horses don't mind them much, but my dogs HATE them. raise cain whenever they're perched around. That's hilarious, horses are so sweet. Sometimes that get scared like a children from foreign things. Happy Thursday to you. LOL Zip is a little territorial ay? Great pictures. I like that horse. What a great story in photos! And no wonder he was all in a huff! what a gorgeous "guard horse"!! I don't blame him. I don't like them either. Zip is a good watch horse--and beautiful! Vultures hanging around would get me all worked up too! 10 vultures! I am afraid that would have creeped me out also. Good for Zip for alerting you. That is so sweet that you shooed them away and he danced around!!! I took a good look before I scrolled any further and did spot a vulture. Why would they even be there? Gives me the creeps. When I see vultures gathered, I always stop and count to see everyone is on their feet...or at least breathing! He's a clever and beautiful horse. what a beautiful setting and horse! 10 vultures = creepy! I'm sure Zip was very appreciative of his mama running them off! Jojo says Zip is a pretty horse! Zip doesn't want those strangers hanging around! 10 vultures?! That is quite a lot! No wonder he was in a huff! Zip is very observant! You can hardly seem the vultures in the first pic. Very pretty horse you have there! Those big birds do look kinda scary sometimes! And noisy! I'd be snorting and prancing to fend off vultures like Zip! Great captures. I love Rural Thursdays despite my slow ability to link up. Thanks for hosting Lisa! No wonder he was all stirred up. I don't like those birds my self. I am sure they had a meal around the area. That's funny! I'm sure my dogs would had been barking their little heads off if those were in our yard. Poor Zip, it would have given me the creeps too!